Germany’s Bundeswehr (Armed Forces) is playing an increasingly prominent role in the NATO deployment in Eastern Europe, which is openly preparing for war against Russia. As part of the current Anakonda 2016 manoeuvres, the largest NATO military exercise since the end of the Cold War, German combat engineers, along with British soldiers, built a 300-plus metre amphibious bridge over the Vistula on Thursday. A short time later, heavily armoured NATO tanks rolled over the bridge on their way east, towards the Russian border. For days, the Bundeswehr web site has carried propaganda articles and videos documenting the move of German troops into Eastern Europe. They have titles such as, “Exercise Anakonda 2016—Minden Pioneers on the way to the Vistula”; “On the final straights to the NATO summit”; “Dragoon Ride II—Dragoons ride into the Baltic”; “By convoy into the Baltic—Advance to the Saber Strike exercise” and “Howitzers into the Baltic—The transfer begins”. The reports provide an overview of the growing German contingent in the east. As part of the “Persistent Presence” manoeuvre, on May 30, “the 3rd Battery of Artillery Battalion 295, under the command of Captain P., left for exercises and training in Lithuania”. In the current naval exercise “BALTOPS” in the Baltic Sea, which includes a total of 45 vessels, 60 aircraft and 4,000 troops from 14 countries, the German Navy is involved with nine units, including the combat support ship “Berlin”, the frigate “Sachsen” and the P-3C “Orion”, a maritime patrol aircraft designed for hunting submarines. The “march diary” of a certain Captain Bumüller of the 12th armoured brigade in Amberg provides an insight into the provocative “Dragoon Ride II”, described as a “massive land march via Poland” to Estonia, where the Bundeswehr is participating with 16 vehicles. 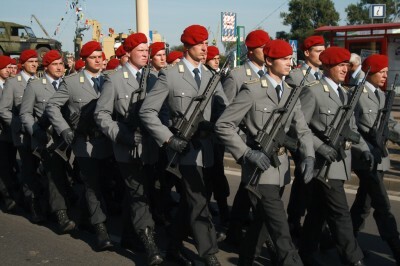 According to media reports, the Bundeswehr is dispatching a total of 5,000 soldiers to Eastern Europe this year alone. The historical and political significance of the German deployment cannot be exaggerated. June 22 marks the 75th anniversary of Operation Barbarossa, the attack by Nazi Germany on the Soviet Union that claimed the lives of 40 million Soviet citizens and was conducted throughout Eastern Europe as a war of extermination. Every square metre over which German tanks and soldiers are once again trampling recalls dark memories of the past crimes of German imperialism. The Nazis initially used occupied Poland as a staging area for the invasion of the Soviet Union. Later, they constructed their extermination camps there. Following the defeat of Nazi Germany, and after the full scope of the Holocaust became known, Germany was forced to observe military restraint for a long time. This began to change with the dissolution of the Soviet Union and German reunification twenty-five years ago. In the last two years, the German ruling class has completely dropped its flowery post-war pacifist phrases. It has returned to an aggressive foreign policy with ominous parallels to that of 1941. According to a report in Die Welt, a new Defence White Paper, which provides for the deployment of the Bundeswehr domestically and for other missions abroad, no longer describes Russia as a “partner”, but rather as a “rival”. Of particular concern to the German government is the increasing use “of hybrid instruments for the targeted blurring of the boundary between war and peace”, and the “subversive undermining of other states”. This narrative has nothing to do with reality. Moscow’s militaristic behaviour is not progressive and increases the danger of war. But in Eastern Europe, it is not Russia that is the aggressor and that “undermines states” and “blurs the boundary between war and peace”, but the Western powers. In Ukraine, Washington and Berlin organized a coup against the pro-Russian President Viktor Yanukovych in early 2014, working closely with fascist forces. Since then, Germany has used the predominantly defensive reaction of Russia in order to systematically beef up its military and go on the offensive. The decisions of the last few weeks to increase defence spending by 130 billion euros and the army by at least 7,000 soldiers are just the beginning. The stated goal of the German government is to gradually increase military spending to two percent of gross domestic product, as required by NATO. News weekly Der Spiegel anticipated that Germany’s defence budget would have to “increase by five and a half billion euros year on year, by the 2024 target date”. The magazine concluded, “In the end, Germany would be the largest military power on the continent by far. Not all European neighbours will like that”. “It has taken decades since the horrors of World War II, but Berlin’s modern-day allies and, it seems, German leaders themselves are finally growing more comfortable with the notion that Germany’s role as the European Union’s de facto leader requires a military dimension”. All this comes “perhaps none too soon”, according to the Times. “The United States and others—including many of Germany’s own defense experts—want Germany to do even more for Continental security and to broaden deployments overseas”. Although Berlin is presently stepping up its defence spending within the framework of NATO, and is deploying its troops to the East as part of the US-led offensive against Russia, there can be no doubt that the future struggle for control of Eurasia, as well as the Middle East and Africa, will lead to violent tensions and conflicts between the imperialist powers, as happened before in the First and Second World War. A current strategy paper of the German Council on Foreign Relations by Joseph Braml, published in business daily Handelsblatt on May 17, accuses the US of following the “motto of the Roman Empire ( divide et impera )”, dividing the world into blocs “in order to better control them”. The editorial culminates with the demand: “Europe, especially the leading European power Germany, should in its own interest, prepare for the United States’ ever clearer concept of the enemy”. At the end of May, writing in Die Zeit under the headline “What unites Obama and Trump”, Theo Sommer railed against American forces in Europe. “The main purpose of their continued presence” is “hardly the defence of Europe”, he complained. “Only the smallest part of their deployment serves the deterrence of Russia”, with the rest aimed at “the protection or assertion of American interests elsewhere in the world”. “Without their upstream positions in Europe, without the ports, air bases, hospitals and command centres in Italy, Spain, Germany and Turkey, the Americans would be as good as operationally incapable in the Middle East, in the Mediterranean, in the Arctic”. The same applies to Africa, he added, and one could also “ask why America’s Africa Command was based in Stuttgart”. Sommer, the long-time editor of the liberal weekly Die Zeit, and Braml, formerly a legislative adviser in the US House of Representatives, have traditionally held a more transatlantic orientation. Their editorials are an indication of the ferocious tensions that are developing below the surface again between the post-war allies, as the imperialist redivision of the world enters a new and dangerous phase.